This is an extraordinarily simple treat that looks fantastic. Make it as a fun sweet-snack or serve it as an elegant dessert. And yes, there are health benefits here! Oranges and dark chocolate both contain anti-inflammatory compounds from a family of antioxidants called flavonoids. Flavonoids are antioxidants that exert anti-inflammatory actions in the body, in addition to combating oxidative stress. One type of flavonoid in oranges, called herperidin, is particularly anti-inflammatory and has been found to reduce cholesterol and blood pressure. Herperidin is found in the white part of the orange. Dark chocolate is also a potent source of flavonoids, specifically, flavonols. The quality of chocolate matters. Chocolate with higher cocoa content will have more flavonols, and will often be lower in added fat and sugar. Oh, and white chocolate? There are no flavonoids in white chocolate, so stick with the dark. Peel the oranges and split into segments. Keep as much white stuff on the orange as you can. Place the chocolate and canola oil in a small dish. Microwave for 20-30 seconds. Mix. Repeat until the chocolate is melted. Be careful not to burn the chocolate. The oil is option. It gives the chocolate a “shine” and it keeps it from hardening while you are dipping. 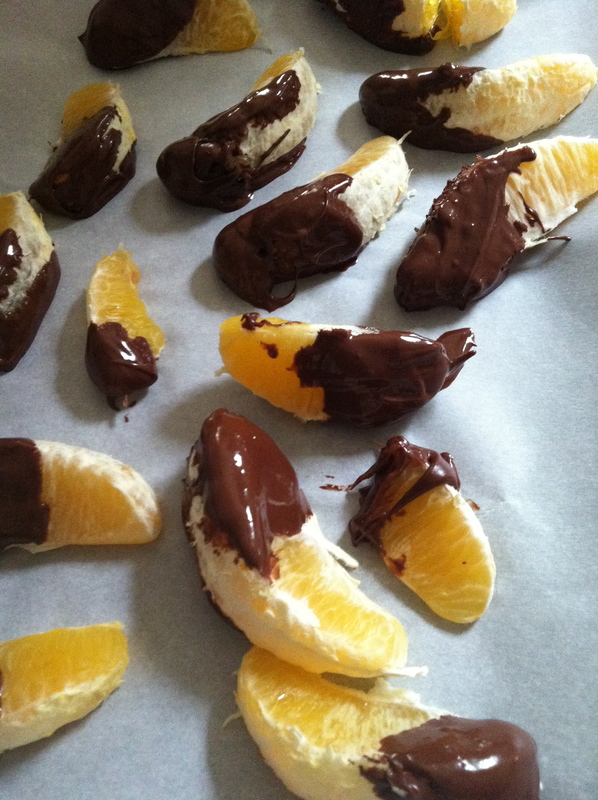 Dip each orange segment into chocolate. Place on the baking sheet. Place baking sheet with dipped oranges in the refrigerator. Let cool until hardened, about 1 hour. Variation: Use any type of fruit that you like! If you only eat the chocolate like Sara and John, is it still healthy? ?